WEST POINT, N.Y. - Sophomore Ryan Leets has been named the Army Athletic Association Athlete of the Week following his stellar performance in goal on Saturday night. Making his first Atlantic Hockey Association start in goal, Leets turned away 34 shots to lead the Black Knights to a 4-1 victory over Niagara. 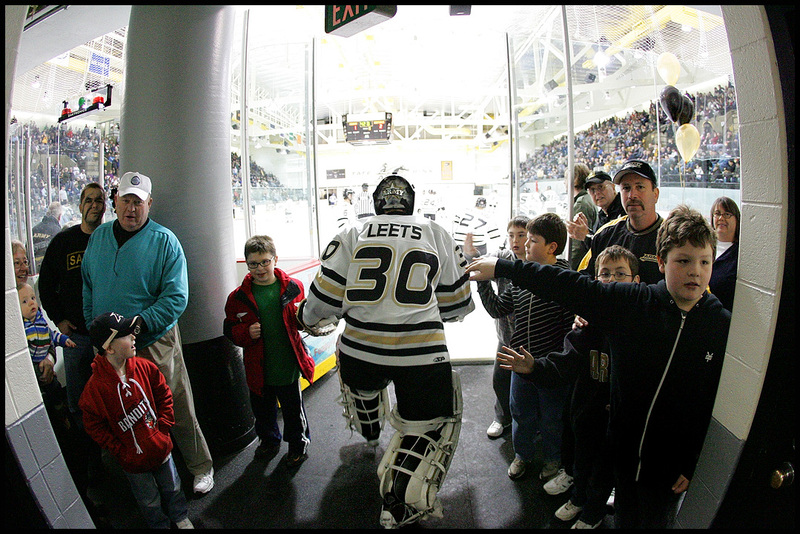 Following a 4-1 loss on Friday night, Leets was given his first league start and backstopped Army to a win against the league's second-place team. Leets, from Kentwood, Mich., allowed just one first-period goal and made 14 saves in the first period, 12 in the second and eight in the final period to improve his career record to 2-0-0. This marks the second consecutive week a hockey player has been chosen the AAA Athlete of the Week following Danny Colvin. Army is now 4-7-1 overall and 3-6-1 in league play and will host Colgate Saturday at 7 p.m. at Tate Rink. A limited number of tickets and rink-side seats remain for the game. For ticket information, call 1-877-TIX-ARMY or click here.